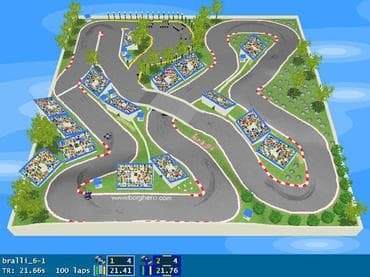 GeneRally is a freeware arcade racing game that is played from a top-down perspective. GeneRally is a fun free racing game for one to six players. You wll be racing on various tracks in time trial mode, or against human/AI opponents in championship mode. Download free game today and play this fun racing game! Free Game features: - 1-6 players; - 12 cars, 36 tracks - thousands of mods; - Time trial, single race & championship modes; - Race in laps, distance or time-based races; - Detailed physics - including tyre wear, fuel use & damage; - Intelligent, fun AI - they'll give you a run for your money; - Support for keyboard and controllers; - Heavily moddable (cars, tracks, sounds, etc. ); - Thriving international community - discuss and race in competitions; - Low system requirements - play on your laptop. Если у Вас есть вопросы, связанные с игрой GeneRally пожалуйста используйте эту форму для связи с нами.